Above is a photo of one of our larger coat of arms mirrors, which was ordered by Adrian and Clare a few weeks ago for a couple of their friends who got married earlier in the year! This engraved mirror measures approximately 33? x 23? 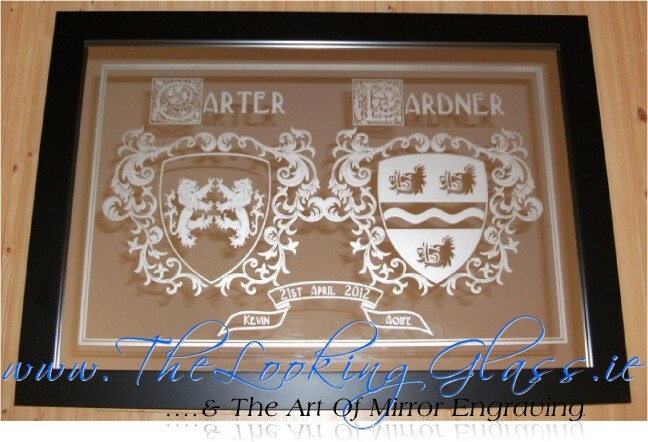 is one of a selection of family crest mirror designs we offer for this size of gift. Finished with a solid black wooden frame, this has been one of our most popular designs this wedding season, with the engraving of the coats of arms complimented by a floral theme in both the capital letters used in the family names, and the surround (known as the mantling) around the shields. Thanks to Adrian for his kind words too…. Thanks again for everything. The mirrors were fantastic and both couples loved them. I will be passing your name on in the future. It has been a great pleasure dealing with you.